Spiritoons! 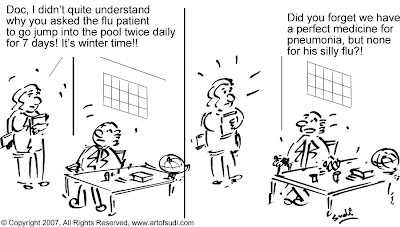 - World's First 'Non-Serious' Spiritual Cartoon Blog: Sudi Narayan's Spiritoon - Got Flu?? Introducing "Spiritoons" - Non-serious Spiritual Cartoons by Swami Anand Teertha (Sudi Narayan). There is much more to these cartoons than mere Humor and Sarcasm. 'Spiritoons' are aimed at transforming the viewers Spiritually in a Non-serious way. Sudi Narayan's Spiritoon - Got Flu?? Thanks for the comment. I don't know what it means. Hope it is something good:). If not, fine as well. nice to find you here.happy to know that you still drawing cartoons.you know,it is you who inspired me in cartooning. hop u r fine there. Good to hear from you. Thanks for the comment. Copyright © 2006-2007 http://www.artofsudi.com/, Young & Bright, Inc. All Rights Reserved. Cartoons on this site are the property of Young & Bright, Inc. Other quoted texts, trademarks and service marks are the property of their respective owners or publishers. 'As unique as everybody else', I have stumbled upon my creative instincts at a very young age. Fascinated by the spiritual wisdom of the ancient east and later inspired by my beloved master 'OSHO', my creativity began to take some interesting turns resulting in what later became Meditation arts and Spiritoons (Spiritual cartoons). In this mystical existence, there is tremendous beauty, consciousness, joy, and celebration 24 hrs a day. But our Mind comes in between and doesn’t allow us to see the reality as it is. Interestingly, except man the whole existence is in bliss already! Overwhelming beauty, mystifying experiences and heartfelt jokes - central themes of meditation art and spiritoons - seems to me be the greatest bridges to Reality as they help one to forget the 'World’, to step outside of their complex Mind to see things as they are. I also work as a Technology Architect for the Healthcare Industry. I live with my lovely wife Nimmi and a beautiful daughter Maya in Suwanee, a northern Atlanta Suburb. We are into Spiritual Inquiry, Travel, Art, Music and Meditation. Feel free to get in touch with us. Happy 2008 - Are you the Man on the Beach ? ?